My first visit to this most colourful region of India in 1988 was followed by many more over the years. As I began to see how fast India was changing, I was led quite naturally to the creation of my first book, Rajasthan. My travel journals, bound by myself and crammed with samples, form the backbone of my text. My journey continued in my studio where I assembled my photographs by hand into collages, treating them almost as if they were paint. 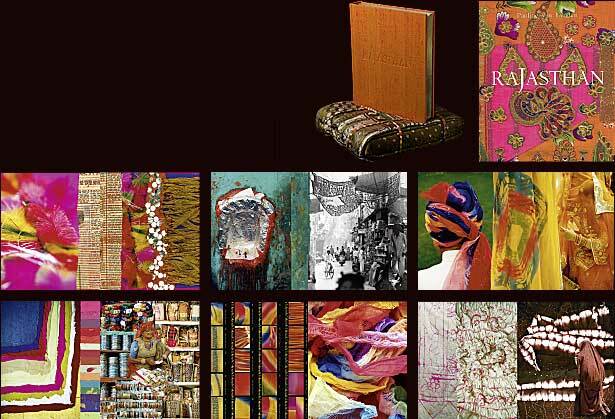 Published in three languages in 2003 and a fourth in 2005, Rajasthan has been a steady favourite with designers, stylists, travellers and India lovers all over the world. Wrapped in the blue shades of the falling night I listened to the sounds of dusk: the cries of the peacocks in the neem trees over my head, the silvery sound of bells for evening service at the nearby temple. And from inside the houses, sparsely lit by naked bulbs, came women’s voices and the smells of cooking on wood fires. An evening like this is a time for stories...of love and courage, of legendary heroes and their brave horses, camel caravans loaded with spices, jewellery, and brocades. Modern anecdotes too, with often a similar flavour and accompanied by lots of laughter. In this land of contrasts, there is a mystery that gives significance to the smallest and the simplest thing. More than anything I wished to show the delight I have found in a way of life which, often with very little means, still results in great beauty.